Learn more about the Flir ONE Pro for iOS with customer reviews, prices, key features, and frequently asked questions. 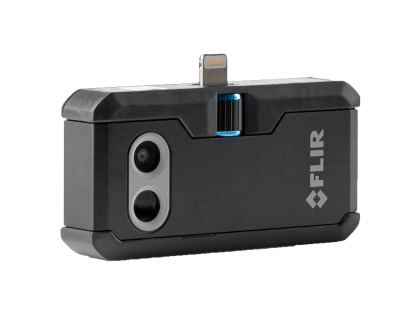 The Flir ONE Pro - iOS is a thermal imaging camera that is designed specifically for use with iOS devices. The compact camera unit plugs into the charging port of an iPhone and can be used to capture heat signatures up to 400°C. Improved image detail & clarity. Expanded temperature measurement up to 400°C. Pros: Compact, rugged design. Easy to use. Cons: The app is slow. Camera charge only lasts for one hour. 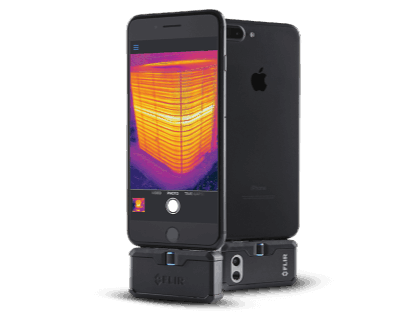 Bottomline: The Flir ONE Pro is a great alternative to more expensive equipment and it is convenient because it turns your iPhone into a thermal camera. How much does the Flir ONE Pro - iOS cost? The Flir ONE Pro for iOS retails for $399.99. Can I use the Flir ONE Pro with my iPad? Yes. The Flir ONE Pro for iOS is designed to work with all iOS devices, so you can use it with your iPad and your iPhone. How do I take pictures with the Flir ONE Pro? To start capturing thermal images, you need to download the Flir One from the App Store. After installing the app, open it up and plug the Flir ONE Pro into your iOS device. From here, you can operate the camera and capture images or videos. Are there any Flir ONE Pro - iOS alternatives? Flir E6 Thermal Imaging IR Camera with Wi-Fi. Flir E6 Thermal Imaging IR Camera with Wi-Fi and CM82 True RMS Power Clamp Meter. Having used all of the FLIR ONE models, I can tell you the new (Gen 3) FLIR ONE Pro is the best so far, by a significant margin. I tried the FLIR ONE Gen 3 PRO! The image quality is fantastic! The software needs work, though. It's great on an iPad (2017), but on my iPhone8 it's buggy as hell.Spot metering doesn't work, saved images are always a mix of visible/IR (no matter what the "mix" is that is selected in the application), and the palette selected always gets thrown to B&W when you take the first image - you have to select a different palette, then the one you want again and it works fine after that.Both iPad and iPhone running iOS 11.2.That being said: works wonderfully on the iPad - no issues there!